We’d love your help. Let us know what’s wrong with this preview of Behind the Curtain by P.C. Zick. When Lisa Williams returns to her hometown of Victory, Florida, with a producer of reality TV shows, not everyone is happy to see her, particularly her sister, Susie. Lisa finds herself at odds with everyone in town, even her close friend Tommy who tries to understand and support her dreams of becoming a star. When Tommy is assigned to cover the show's filming as a reporte When Lisa Williams returns to her hometown of Victory, Florida, with a producer of reality TV shows, not everyone is happy to see her, particularly her sister, Susie. Lisa finds herself at odds with everyone in town, even her close friend Tommy who tries to understand and support her dreams of becoming a star. When Tommy is assigned to cover the show's filming as a reporter for the Tampa Tribune, he finds himself at odds with Lisa who he's beginning to think of as more than a friend. To ask other readers questions about Behind the Curtain, please sign up. 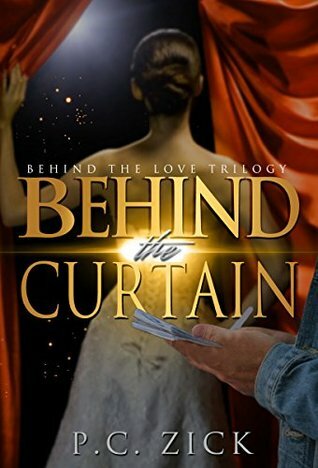 Behind the Curtain, is the third book in the Behind the Love series, and it is my favourite of the first three books. I came extremely close to handing over a four star rating to this one, yet I’ve been in one of those states recently where I need to be really impressed with a story to round my rating up. Therefore, whilst I gave this one a three-point-five star rating, I’m sure many will easily hand over a full four star rating. Behind the Altar and Behind the Bar were two very different kinds o Behind the Curtain, is the third book in the Behind the Love series, and it is my favourite of the first three books. I came extremely close to handing over a four star rating to this one, yet I’ve been in one of those states recently where I need to be really impressed with a story to round my rating up. Therefore, whilst I gave this one a three-point-five star rating, I’m sure many will easily hand over a full four star rating. Behind the Altar and Behind the Bar were two very different kinds of stories, and Behind the Curtain keeps up with the constantly changing feel of the series. All the books are linked through the characters, yet the types of story that play out alter drastically. It makes for such an interesting series, leaving you unsure as to what you will get with the next book. For me, Behind the Curtains is my favourite of the first three books because it deals with one of my favourite storylines – reality television. I’m not a fan of reality television, yet I positively adore romance novels that use it as a backdrop. These books are always filled with such tension, offering up endless drama. All the books in the Behind the Love series had delivered a decent amount of drama, yet Behind the Curtain steps the drama up some more. There is more to the story than simply drama, though. In addition to all the drama of reality television, we also have an emotional component to the story. These two elements come together so well to make for a wonderful tale. The only reason I rounded my rating down, is because I’m accustomed to more drama in my reality television reads. There was a decent amount of drama in this one, yes, but it seemed lacking in comparison to what I’m accustomed to in such books. I loved all the drama that unfolded, but I kept waiting for something a little bit more. I especially wanted more reality television drama between the two main characters of the story – it felt as though they had their one big moment, and then were brushed under the rug for other things. I’m used to these kind of things being turned into massive things, and was constantly waiting for that something more to hit. As with the prior book, we also get to continue the overall tale of the people within the town. We get to see even more of the characters from the prior books, giving us even more details of what has been happening in their lives. The constant development of their stories throughout make for a great read. Lisa Williams is trying to get her career as an actress into the mainstream. When she returns to New York after some time in Victory, Florida where everything went wrong she is approached by her boyfriend Jet Rogers about staring in a reality series. But she has to film in Victory and it is to be produced by Colin Shepard. Tommy Jackson is a reporter for the Tampa Times Courier who grew up with Lisa in Victory. He has agreed to cover the reality show and sees a different side of Lisa that he is u Lisa Williams is trying to get her career as an actress into the mainstream. When she returns to New York after some time in Victory, Florida where everything went wrong she is approached by her boyfriend Jet Rogers about staring in a reality series. But she has to film in Victory and it is to be produced by Colin Shepard. Tommy Jackson is a reporter for the Tampa Times Courier who grew up with Lisa in Victory. He has agreed to cover the reality show and sees a different side of Lisa that he is used to seeing. He tries to cover the story with honesty but has a hard time separating how he feels for Lisa and the truth of what is going on. When Lisa's best friend Sally Jean also agrees to do the show tension mounts between the two and their friendship is on the line. Soon everyone involved isn't sure what is pretend and what is real. Will Lisa discover if Jet really wants her or just the fame and is she wanting a true authentic life or one based on lies and fame? When Victory is put through the ringer with the reality show will friendships and relationships survive the pressure? I really enjoyed this book and felt super bad for Lisa with what she was faced with. In one sense she brought this on herself wanting to be famous and on the other hand there were certain events that were totally exploited and devastating to her. She felt as though all of her secrets were exploited and it also affected Susie and a few residents of Victory. Lisa was naive to a certain degree but knew that she wanted her name in lights so she went along with everything that Jet and Colin told her to do until she realized how much it was hurting her and those close to her. Lisa really had to dig deep to figure out what it was that she wanted and needed. I like how she gradually worked things to her favor but in the process managed to lose some things that were important to her. Tommy was always there for Lisa but was uncertain if certain things were the "real" or "actress" part of Lisa. He wanted to be there for her but didn't want to be used by her need for fame. I loved his mom and she was such a great person and support for Tommy and told him what he needed to hear. His friendship with Lisa was solid and both wanted more but were unsure of how to go about it when Lisa was still involved with Jet. I felt bad for Sally Jean but I was definitely mad at her as well many times for revealing so many secrets and dark times for Lisa. I knew she wanted to be famous but it almost cost her a friendship with Lisa. Gradually she began to see what was happening but it definitely took some time. I loved how we get to catch up with the characters from previous books and the ending with Susie was awesome! This is such a great series and I can't wait to see what happens next!! This is the third book in this series by this author. This is the shortest story so far in this series. This is a fast paced contemporary romance story. This book as fantastic characters. My only problem is the length is too short. I can't wait to read more from this author in the future. Great story and characters! The unique storyline pulls you in and the characters become like friends. Definitely a favorite romance trilogy. Though the third book of Behind the Love Trilogy, this book makes an enjoyable fast pace contemporary romance reading, a good stand-alone story of a would-rather-forget childhood memory in a small town which caught a reality TV show producer's attention. A chance of a life time opportunity at an acting career which threatens Lisa's relationships with her sister, her best friend, and her old childhood friend (which could be more than friend), and just about with everyone else in town upon her ret Though the third book of Behind the Love Trilogy, this book makes an enjoyable fast pace contemporary romance reading, a good stand-alone story of a would-rather-forget childhood memory in a small town which caught a reality TV show producer's attention. A chance of a life time opportunity at an acting career which threatens Lisa's relationships with her sister, her best friend, and her old childhood friend (which could be more than friend), and just about with everyone else in town upon her return to this small town with TV show and the camera crews in tow. Forced Lisa to find out which is more important in life for her; career vs family and friends who love her. Already having been captivated by the characters and plots of Book 1 and Book 2 of this series, I couldn’t wait to dive into BEHIND THE CURTAIN: Book 3. As with the previous books in this series, this book also begins with a marriage. The happy couple is Reggie and Susie from Book 2, and all appears perfect. Or is it? Sure, the bride and groom are in harmonious rapture, but the bride’s sister, Lisa, is ill at ease. Years before, she had left this small Florida town named Victory, to go to New York City to escape her ugly childhood and pursue a career as a successful actress. And now, back in the “bosom” of her family and old friends, emotional triggers are misfiring every which way. Then opportunity knocks. She is approached by a reality show producer/director and told if she is willing to have the show’s location shoot in her hometown of Victory, she can be its main star. Despite some misgivings, ambition rears its ugly head and she welcomes an entire television crew to relocate and film. Talk about a soap opera! One disastrous situation after another and one old time hurt after another makes for nonstop, edge-of-your-seat reading. And when she meets up with an old journalist friend and a different kind of sparks fly, it’s basically an emotional free-for-all. Once again, this author has produced a 5* gem. I'm a storyteller who writes. It's as simple and as complicated as that. I have always been a writer and reader. I dabbled with writing during vacations from teaching. I always received praise for my writing. As a high school English teacher, I became known as the “writing teacher” and taught creative writing and gave writing workshops to other teachers. When I burned out on teaching students to wr I'm a storyteller who writes. It's as simple and as complicated as that. I have always been a writer and reader. I dabbled with writing during vacations from teaching. I always received praise for my writing. As a high school English teacher, I became known as the “writing teacher” and taught creative writing and gave writing workshops to other teachers. When I burned out on teaching students to write, I began getting more serious about my own writing, and one summer I finished a novel that had been languishing in a file cabinet drawer for ten years. A small publisher picked it up after my tenth query letter. I retired from teaching in June 2001 and began working as a journalist while writing novels in the evening and early morning hours. I’ve never looked back. It’s very exciting to be involved in the new revolution in writing and publishing today. I’m learning something every day that teaches me I still have much more to learn. Trails in the Sand is my fifth published novel. Right before I started writing it, I was embroiled in the real-life drama of the Deepwater Horizon oil spill as a public relations director for Florida’s fish and wildlife agency. I handled the media for the sea turtle nest relocation project that took place during the summer of 2010. At the same time, I was beginning a new relationship with a lost love from thirty-five years ago. We married in August 2010. During the environmental disaster, I was in the process of moving to Pittsburgh to be with my new husband. Two weeks prior to the oil spill, twenty-nine miners were killed in a coal mine explosion in West Virginia, just a few hours from where I was moving. It all fell into place. Trails in the Sand is about restoration and redemption in both nature and human relationships. It also asks the question: Can we make up for something we destroy?